Epidemiological Observational study of populations around the world and the impact of nutrition on health. Diets with a high consumption of saturated fat are associated with an increased risk of heart attacks. Does not determine cause-and-effect relationships. Intervention Clinical Trials Scientific investigations where a variable is changed between groups. Testing the effect of different diets on blood pressure. One group consumes an American diet, group 2 eats a diet rich in fruits and vegetables, and group 3 eats a combination of groups 1 and 2. If done correctly, it does determine cause-and-effect relationships. Randomized Clinical Trials Participants are assigned by chance to separate groups that compare different treatments. Neither the researchers nor the participants can choose which group a participant is assigned. Testing the effect of calcium supplements on women with osteoporosis. Participants are given a pill daily of a placebo or calcium supplement. Neither the participant nor the researcher know what group the participant is in. Considered the “gold” standard for scientific studies. Animal and Cellular Biology Studies are conducted on animals or on cells. Testing the effects of a new blood pressure drug on guinea pigs or on the lipid membrane of a cell. Less expensive than human trials. Study is not on whole humans so it may be not applicable. Nutritional assessment is the interpretation of anthropometric, biochemical (laboratory), clinical and dietary data to determine whether a person or groups of people are well nourished or malnourished (overnourished or undernourished). 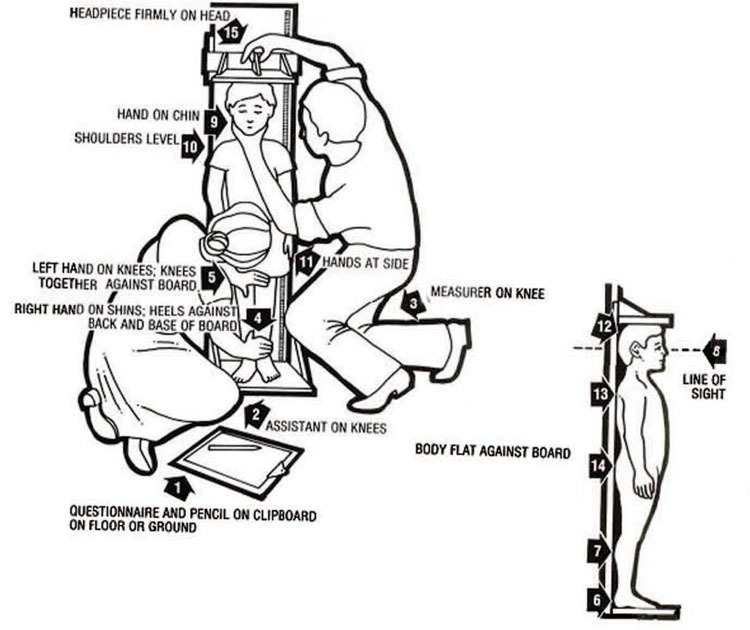 The word anthropometry comes from two words: Anthropo means ‘human’ and metry means ‘measurement’. The different measurements taken to assess growth and body composition are presented below. Biochemical or laboratory methods of assessment include measuring a nutrient or its metabolite in the blood, feces, urine or other tissues that have a relationship with the nutrient. An example of this method would be to take blood samples to measure levels of glucose in the body. 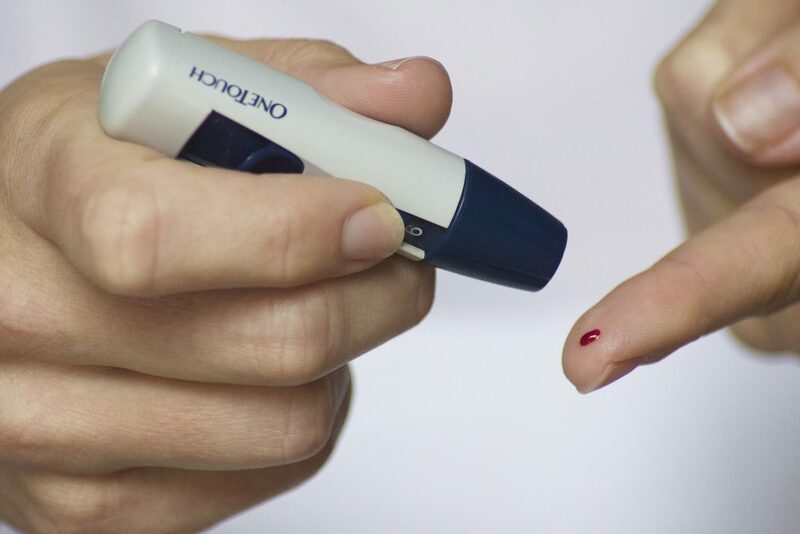 This method is useful for determining if an individual has diabetes. In addition to the anthropometric assessments, you can also assess clinical signs and symptoms that might indicate potential specific nutrient deficiency. Special attention are given to organs such as skin, eyes, tongue, ears, mouth, hair, nails, and gums. Clinical methods of assessing nutritional status involve checking signs of deficiency at specific places on the body or asking the patient whether they have any symptoms that might suggest nutrient deficiency. A trained professional asks the subject to recall all food and drink consumed in the previous 24 hours. This is a quick and easy method. However, it is dependent upon the subject’s short-term memory and may not be very accurate. The subject is given a list of foods and asked to indicate intake per day, per week, and per month. This method is inexpensive and easy to administer. It is more accurate than the 24 hour recall. Food intake is recorded by the subject at the time of eating. This method is reliable but difficult to maintain. Also known as a food journal or food record. This method requires food to be weighed and exactly calculated. It is very accurate but rarely used because it is time-consuming and expensive. Science is always moving forward, albeit sometimes slowly. One study is not enough to make a guideline or a recommendation, or cure a disease. Science is a stepwise process that builds on past evidence and finally culminates into a well-accepted conclusion. Unfortunately, not all scientific conclusions are developed in the interest of human health, and some can be biased. Therefore, it is important to know where a scientific study was conducted and who provided the funding, as this can have an impact on the scientific conclusions being made. For example, an air quality study paid for by a tobacco company diminishes its value in the minds of readers as well as a red meat study performed at a laboratory funded by a national beef association. One of the newest areas in the realm of nutritional science is the scientific discipline of nutritional genetics, also called nutrigenomics. Genes are part of DNA and contain the genetic information that make up all of our traits. Genes are codes for proteins and when they are turned “on” or “off,” they change how the body works. While we know that health is defined as more than just the absence of disease, there are currently very few accurate genetic markers of good health. Rather, there are many more genetic markers for disease. However, science is evolving, and nutritional genetics aims to identify what nutrients to eat to “turn on” healthy genes and “turn off” genes that cause disease. As science evolves, so does technology. Both can be used to create a healthy diet, optimize health, and prevent disease. Picture yourself not too far into the future: you are wearing a small “dietary watch” that painlessly samples your blood, and downloads the information to your cell phone, which has an app that evaluates the nutrient profile of your blood and then recommends a snack or dinner menu to assure you maintain adequate nutrient levels. What else is not far off? How about another app that provides a shopping list that adheres to all dietary guidelines and is emailed to the central server at your local grocer, who then delivers the food to your home? The food is then stored in your smart fridge which documents your daily diet at home and delivers your weekly dietary assessment to your home computer. At your computer, you can compare your diet with other diets aimed at weight loss, optimal strength training, reduction in risk for specific diseases or any other health goals you may have. You also may delve into the field of nutritional genetics and download your gene expression profiles to a database that analyzes your genes against millions of others. A motivational speaker once said, “A smart person believes half of what they read. An intelligent person knows which half to believe.” In this age of information, where instant Internet access is just a click away, it is easy to be misled if you do not know where to go for reliable nutrition information. How do you react when you read news of this nature? Do you boycott margarine and coffee? When reading nutrition-related claims, articles, websites, or advertisements, always remember that one study does not substantiate a fact. One study neither proves nor disproves anything. Readers who may be looking for complex answers to nutritional dilemmas can quickly misconstrue such statements and be led down a path of misinformation. Listed below are ways that you can develop discerning eyes when reading nutritional news. The scientific study under discussion should be published in a peer reviewed journal, such as the Journal of Nutrition. Question studies that come from less trustworthy sources (such as non peer-reviewed journals or websites) or that are not formally published. Credible reports often disseminate new findings in the context of previous research. A single study on its own gives you very limited information, but if a body of literature supports a finding, it adds to credibility. When reading such news, ask yourself, “Is this making sense?” Even if coffee does adversely affect the nervous system, do you drink enough of it to see any negative effects? Remember, if a headline professes a new remedy for a nutrition-related topic, it may well be a research-supported piece of news, but more often than not, it is a sensational story designed to catch the attention of an unsuspecting consumer. Track down the original journal article to see if it really supports the conclusions being drawn in the news report. Does the site contain links to other credible informational websites? Even better, does it reference peer-reviewed journal articles? If so, do those journal articles actually back up the claims being made on the website? Now let’s consider some reputable organizations and websites from which you can usually obtain valid nutrition information. Authoritative nutritional news will be based upon solid scientific evidence, supported by multiple studies, and published in peer-reviewed journals. Whatever the source of your nutritional news, remember to apply the criteria outlined above to help ensure the validity of the information presented. Below are some examples of websites which can be considered credible sources for nutritional news. US Department of Agriculture Food and Nutrition Information Center. The USDA site http://fnic.nal.usda.gov has more than 2,500 links to information about diet, nutrition, diet and disease, weight and obesity, food-safety and food-labeling, packaging, dietary supplements and consumer questions. Using this interactive site, you can find tips and resources on how to eat a healthy diet, nutritional information, and a food planner. The Academy of Nutrition and Dietetics (AND). The AND promotes scientific, evidenced-based, research-supported food and nutrition related information on its website, http://www.eatright.org. It is focused on informing the public about recent scientific discoveries and studies, weight-loss concerns, food safety topics, nutrition issues, and disease prevention. Department of Health and Human Services (HHS). The HHS website, HealthFinder.gov, provides credible information about healthful lifestyles and the latest in health news. A variety of online tools are available to assist with food-planning, weight maintenance, physical activity, and dietary goals. You can also find healthful tips for all age groups, tips for preventing disease, and information on daily health issues in general. Centers for Disease Control and Prevention (CDC). The Centers for Disease Control and Prevention (http://www.cdc.gov) distributes an online newsletter called CDC Vital Signs which provides up-to-date public health information and data regarding food, nutrition, cholesterol, high blood pressure, obesity, teenage drinking, and tobacco usage. Types of Scientific Studies by University of Hawai’i at Mānoa Food Science and Human Nutrition Program is licensed under a Creative Commons Attribution-NonCommercial-ShareAlike 4.0 International License, except where otherwise noted.